Acer today introduced the Acer Chromebook Spin 15 (CP315-1H), the industry’s first convertible Chromebook with a 15.6-inch display. The large touchscreen display pairs with the convertible 360-degree design to deliver a powerful and portable Chromebook with first-rate entertainment and productivity capabilities. In addition, Acer is launching a new Chromebook 15 (CB315-1H/1HT) line that pairs a large 15-inch display and long 14-hour battery life at a budget-friendly price. Both the new Acer Chromebook Spin 15 (CP315-1H) and Chromebook 15 (CB315-1H/1HT) fully support Android apps via Google Play, joining the performance, security and simplicity of Chrome with the more than two million Android apps that consumers know and love. The new Acer Chromebook Spin 15’s large 1080p display is ideal for people who want an affordable computer that can also be used for entertainment in homes, apartments or dorm rooms. The 1920x1080 resolution delivers sharp visuals while IPS technology provides wide viewing angles for sharing streaming video. Plus, the display supports 10-finger touch for responsive website browsing and running the latest apps. The large FHD IPS display is complemented by two full-sized upward-facing speakers that deliver enhanced volume and audio range for an excellent HD entertainment experience. The large display boosts productivity with the additional screen real estate for apps and tabs. This also makes room for a comfortable full-sized keyboard and a large Corning® Gorilla® Glass touchpad that provides smooth navigation through sites and apps. The Acer Chromebook Spin 15’s 360-degree hinges allow the touchscreen display to be rotated a full 360°until it becomes completely open and ready for use as a large tablet for reading online content, enjoying video and staying in touch on social media. This convertible design means that the keyboard can be quickly manoeuvred back for use in traditional notebook mode. In addition, customers can stand it up in display mode to get closer to the screen, or use it in tent-mode for constrained spaces like airplane cabins. The Chromebook Spin 15 has a silver cross-hairline pattern on the top cover that looks great in any setting. This unique silky texture provides a premium look that’s professional enough for the office and stylish enough for the home. The Chromebook Spin 15 can easily be moved around the home or office since it weighs only 2.1kg (4.63 pounds). The new Acer Chromebook Spin 15 can be used for a full day of work or school, plus streaming and fun since it delivers industry-leading battery life of up to 13 hours2. The fanless design allows it to run quietly, making it great for shared spaces such as a family room, library or coffee shop. It provides solid everyday performance, since it’s powered by the quad-core Intel® Pentium® N4200 processor, Intel® Celeron® N3450 processor, or the dual-core Intel® Celeron® N3350 processor. It comes with 4GB or 8GB LPDDR4 memory and either 32GB or 64GB of on–board eMMC storage. Fast and reliable 2x2 MIMO 802.11ac Wi-Fi keeps customers connected, while Bluetooth 4.2 provides a convenient connection to peripherals. The Acer 720p HD webcam has high dynamic range (HDR) and a wide field of view for accommodating groups in video conferences and Google Hangouts. The new Acer Chromebook Spin 15 has two USB 3.1 Type-C Gen 1 ports for quick transfer of data, connecting to an HD display as well as charging the device or other products. In addition, the Acer Chromebook Spin 15 includes two USB 3.0 ports and a MicroSD card reader. 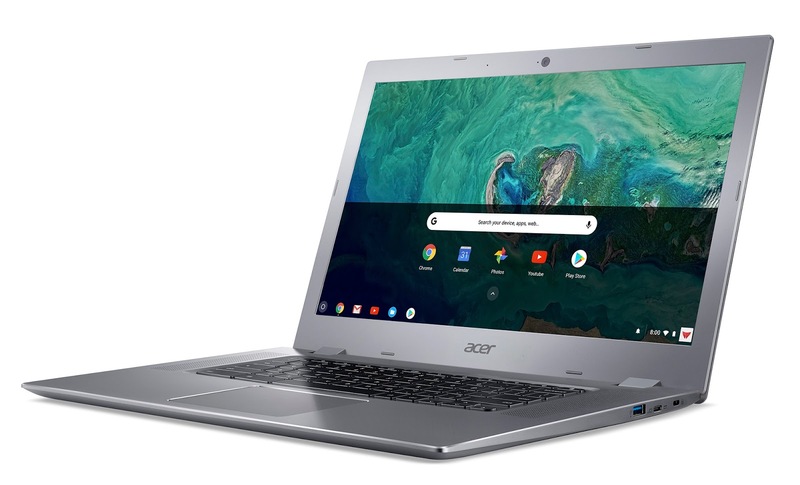 Acer is also introducing a new model in its popular Chromebook 15 line that delivers the same large 15.6-inch display and long 14-hour battery life at a budget-friendly price. The Chromebook 15 has a vibrant Full HD 15.6-inch display in both touch (CB315-1HT) and non-touch (CB315-1H) displays that both provide a Full HD 1920x1080 resolution ideal for enjoying Android apps and viewing multiple tabs and apps. The Chromebook 15 is powered by the quad-core Intel Pentium N4200 processor, the dual-core Intel Celeron N3350 processor, or quad-core Intel Celeron N3450 processor and comes with two full-sized upward-facing speakers that support high-definition audio. It can be connected to a wireless network via Intel® Wireless-AC 7265 (802.11ac 2x2 MIMO) WiFi and to other devices with its two USB 3.1 Type-C ports and two USB 3.0 ports. It will be available with up to 8MB dual-channel LPDDR4 memory and 64GB of on–board eMMC storage. Both new Acer Chromebooks are easy to use and can be easily shared between multiple users. Customers simply log into their own Google account to access their Gmail, Google Docs, apps, extensions, bookmarks and other information. Chromebooks run on Google’s Chrome OS platform, which provides automatic updates and multiple levels of security to guard users against ever-changing online threats. Exact specifications, prices, and availability will vary by region. 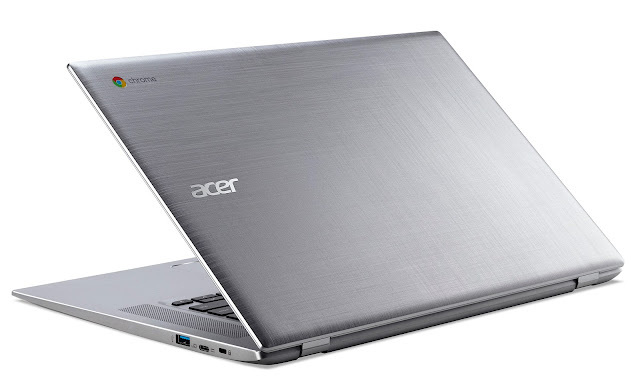 To find out about availability, product specifications and prices in specific markets, please contact your nearest Acer office or retailer via www.acer.com. The new Acer Chromebook Spin 15 and Chromebook 15 were unveiled today at the next@acer press event held in New York, where the company announced a range of new devices and solutions for gamers, creators, families, students and professionals. For more information, visit www.acer.com/nextatacer.